mycraftworks: DT post for Challenge no.8 in FB. DT post for Challenge no.8 in FB. i am back to post my work as DT member in IQC going on in FB. 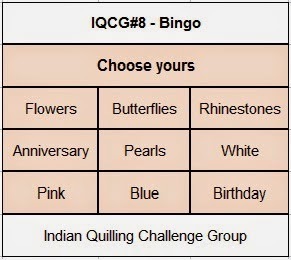 This time it is an interesting theme- Bingo..
and i choosed my fav - Blue, Butterfly and peals ... made a paper quilled keychain out of it. hope u all liked it.